'Freedom.' The very mention of the song conjures images of Richie Havens at Woodstock, fiercely strumming his guitar and lost in an improvisational moment of creation. An intensely engaging performer, Havens honed his craft in the clubs and cafes of Greenwich Village, just over the bridge from his native Brooklyn. Painter, poet and multi-instrumentalist, Havens immersed himself in the Village’s beatnik culture just as the nascent folk scene began to develop. Connecting with uber-manager Albert Grossman, then guiding the careers of Bob Dylan and Peter, Paul and Mary, Havens rose to the top tier of the international folk movement. 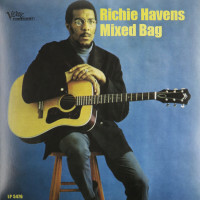 Signed to Verve Forecast, Havens released his first album, Mixed Bag, in August of 1967. The intriguing LP gathered songs from Gordon Lightfoot, Bob Dylan, Lennon/McCartney as well as two self-penned compositions and one co-written with future acting star Lou Gossett, Jr. The album’s instrumentation featured Havens on sitar and acoustic guitar played in his unique style, thumb chording songs in open D tuning. Soaring above it all was his commanding baritone, a voice that injected gravitas into every song, bringing the lyrics to vivid life. A stunning debut, it climbed both the pop and jazz Billboard charts. Havens followed up a year later with Something Else Again:. The cover portrait found Havens clad in dashiki and wearing beads while playing a sitar, looking like a standard bearer for the counterculture. The songs’ subject matter followed that direction as well, dealing primarily with social issues rather than relationships. 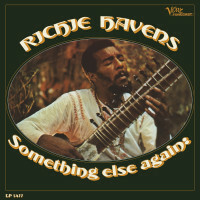 It was another charting record for Havens, reaching #184 on Billboard’s Pop Albums. More than mere albums, Mixed Bag and Something Else Again: were signposts for a rapidly changing culture, leading the way to a more enlightened existence. Sundazed Music presents these two vital albums in their rare mono versions, sourced from the original Verve masters, and pressed on lush 180gm vinyl. Cue them up and hear the glorious sound of artistic freedom pouring from your speakers. Kundenbewertungen für "Somethin' Else Again - 180g Mono Edition"